In technology, slim and small rules. Compact gadgets simply get more attention. For flash drives, it’s always nice to get more gigabytes in a smaller package. Fortunately, ultra-portable flash drives such as this Verbatim Tuff N Tiny and the Super Talent’s Pico are beginning to gain popularity. I truly found myself appreciating the convenience of the Verbatim’s size even though real-life transfer speeds were a bit slower than I had hoped. And for those wondering, this is a standard flash drive. It will fit into any USB 2.0 port on your desktop, laptop, or netbook without any special adapters. After reviewing Verbatim’s Tuff Clip, I was a bit skeptical of their definition of “Tuff”. I was in for a surprise to see how much of a punch this little flash drive packs. For starters, although quite thin, a lot of force would be needed to snap the Tuff N Tiny flash drive. It’s rohbust and shouldn’t break from daily use. It’s an inch long and about the width of a penny. (1.19 L x .5 W x .06 H inches) This flash drive will last through plenty of accidents. Since it’s so light weight, drops won’t do much damage to it. It’s even water proof and should continue to read and write after a dip. Plus, the simplicity is what stands out the most. It’s a flat rectangular piece of plastic with no excess bells or whistles, just a ring for easy key storage. On the back side, there’s four strips of metal flush into the surface for connectivity with a USB port. Even though the Pico may seem more stylish, it was slightly thicker and was often a tight fit into most USB ports. The one thing this flash drive lacks is an LED indicator to display when it’s busy. I should also mention that I often found myself trying to figure out which which way to insert the flash drive into a USB port since there’s no symbol. I unfortunatley ended up scratching the plastic side on serveral occasions. The Tuff ‘N’ Tiny works like any other flash drive on the market. For real-life performance, the write speed were a little slower than I expected. Write speeds on average were around 10.5 MB/s and read speed were about 21.5 MB/s. It took about 1 minute and 15 seconds to transfer a 700MB video file to the flash drive and only 30 seconds to copy it back. The gap in read are write speeds are normal for flash drives. In comparison with other flash drives we’ve reviewed, ﻿the IronKey was faster in both read and write, but it also costs a couple times more. The benchmark speeds for this drive were faster than the speeds I previously mentioned. Our benchmarking tool, HD Tune, displayed a transfer rate of 25.1 MB/s and an access time of 0.8. 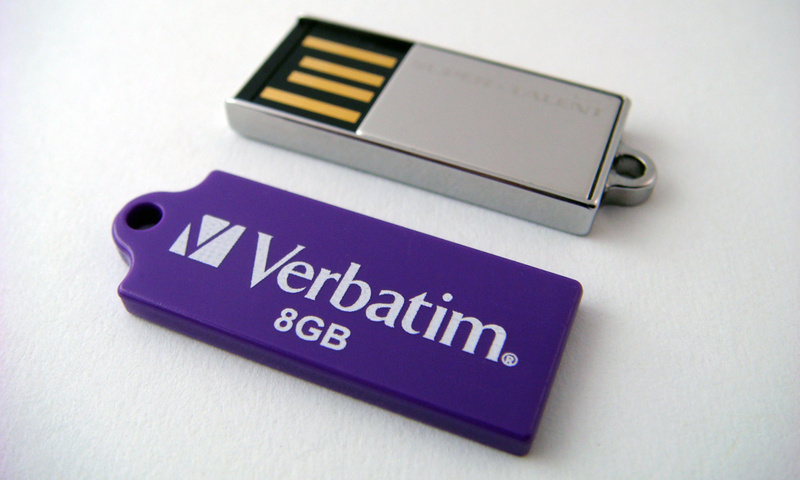 The flash drive we reviewed was the 8GB model, but it’s also available in a 4GB and 2GB capacity. The drive is also fast enough for use with the Windows ReadyBoost feature to increase system performance. I didn’t notice any improvements on my PC when using ReadyBoost with this flash drive, however that’s probably because there’s not much more it probably can do if you already have 4GB of RAM. There’s also a security feature that lets you set a password for the flash drive, but it’s probably more of a gimmick. Devices such as the IronKey offer real hardware encryption to prevent unwanted eyes from viewing your files. The Tuff ‘N’ Tiny exceed almost all of my expectations. The size simply makes this device stand out. It’s quite convenient since it’s thin enough to even slight into your wallet if you wish not to attach it to a key chain. The write speed was a little slower than I most brand name flash drives, but considering the size, it’s far from having to be categorized as slow. The durability and size are the biggest features of the Tuff ‘N’ Tiny. 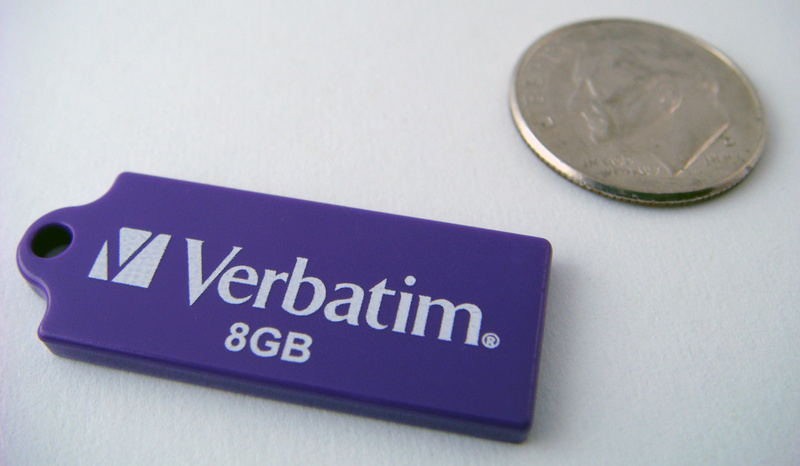 Unlike most flash drives that will begin to wear down, show scratches, and eventually crack or break, the Verbatim Tuff N Tiny won’t. That being said, just be careful not to loose it. Fortunatley the bright purple Barney-like color helps it stand out when on your desk. Overall, I found myself highly satisfied with Verbatim’s Tuff ‘N’ Tiny and I strongly recommend it to anyone looking for a new flash drive. You can find it in three different storage capacities for a fair price: 2GB Orange $17, 4GB Green $20, and 8GB Purple $26. Between the Pico and the Tuff ‘N’ Tiny, which one is shorter in the longest direction? (including the ring). It looks close in the photo, but it’s difficult to tell. I have a toughbook computer that I’d like to leave the drive in all the time for extra storage, and there’s a chance one of them can stay with the flaps closed up. Woops, didn’t read the second part of your comment. I wouldn’t suggest leaving anything that isn’t entirely flush plugged into your laptop’s USB port. There is a good chance of it damaging your machine’s USB port, not just the flash drive. Also, the Verbatim feels light weight and a bit cheaper. But it is very thin an won’t break from a fall unless you snap it. The Super Talent is a heavy and strong. It feels more expensive, but it is thicker and is a bit tougher to fit into some USB ports.